The taxonomy of cannabis is changing. That is, the definition of what makes cannabis cannabis is changing. What we know as indica and sativa is not the full truth. It’s been diluted a lot through pop culture and a lack of scientific information regarding the origins of cannabis and how it has been bred through the generations. There are two main origins for cannabis. What we have come to know as sativa is originally from Europe. Specifically, sativa comes from European hemp. This makes sense when you consider the stretching qualities of “sativa” plants, similar to hemp. Indica on the other hand originated in Asia. The Middle East, Southeast Asia and other surrounding areas hosted this “drug cultivar” of cannabis that grew shorter and developed heavier cannabinoid content through enduring more harsh weather conditions. While indica naturally developed into its drug cultivar through its environmental conditions, sativa had to be bred over time to develop its drug cultivar. The reality is that most of the cannabis that people will consume in the western hemisphere will be indica. Technically, the only truly classified sativa is European hemp. But through evolution of the plant and breeding it has become very diluted. While indica naturally produces drug-like effects, sativa contributed its strong cannabinoid contents to combine for what’s become known as the entourage effect in modern cannabis. The interaction of potentially over one hundred different cannabinoids combine to products the typical effects felt when consuming cannabis. The bigger reality is that it goes much deeper. As Jessica Baker puts it, “there’s actually seven distinct biotypes, of three species, that came from six subspecies that are now extinct, or thought to be extinct.” If that sounds a little too complex, just let Jessica explain it! 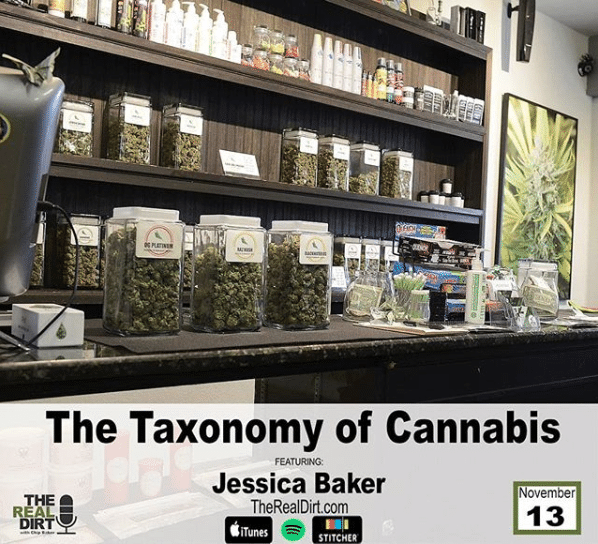 Tune into to this week’s episode of The Real Dirt where Chip sits down with Jessica Baker to talk about the new taxonomy of cannabis and how everything we have come to know about cannabis in the dispensary is just scraping the surface. This is not exactly correct. Yes, Cannabis Sativa is plain old Hemp. And what is called Sativa is actually Cannabis Indica. However, what everyone calls Indica is actually Cannabis Afghanica, also known as Cannabis Kafiristanica.